You already know what it is! 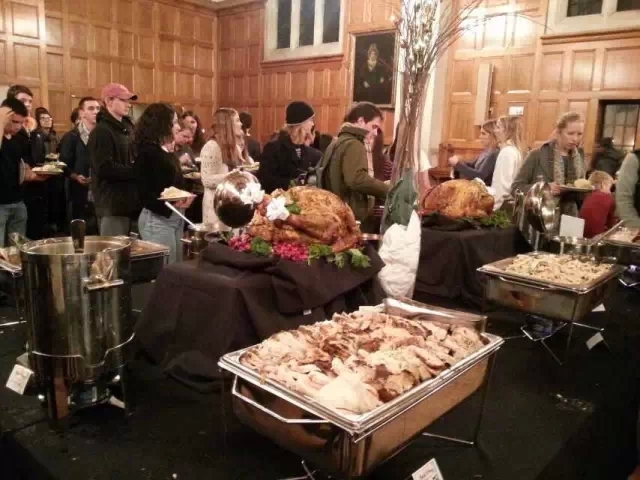 But in case you don’t, Peircegiving is the highly anticipated, annual autumnal feast that will be taking place in Peirce Dining Hall this Wednesday (tomorrow!) from 5-8 PM. Grab some friends, grab a table, and grab stock of your year so far and really think about what and who you’re thankful for as you funnel hot gravy and chilled cranberry sauce down your throat like a goose being forcefed corn in order to fatten its liver for foie gras! (Ed. Note: that image is really sad and graphic and that type of farming is rly messed up, sorry about that, this Peircegiving i am thankful for ethical agriculture, ty and have a good break every1).